Boeing Defence Australia says the JP 9000 Phase 7 Helicopter Aircrew Training System (HATS) program remains on track to begin training new student pilots and aircrew from early 2018, despite early delays with the project. The Defence Portfolio Budget Statements 2016-17 notes that the HATS project, which is acquiring 15 Airbus EC135 helicopters plus a new training centre with three flight simulators, was “approximately six months behind schedule in the design of the total training system”. But a spokesperson for HATS prime contractor Boeing Defence Australia told sister publication Australian Defence Business Review that student training will commence as contracted in early 2018. “Boeing Defence Australia is executing the Helicopter Aircrew Training System program to an agreed plan in partnership with the Commonwealth,” the spokesperson said. Once operational next year, the HATS facility at HMAS Albatross, Nowra will support the training of up to 116 pilots, aviation warfare officers, aircrew, sensor operators and instructors a year. Separately the Australian National Audit Office’s 2015-16 Major Projects Report, released late last month, found that this “project is at an early stage and continues to work through design reviews and deficiencies discovered during testing of the flight simulator”. It also reports that the project “currently expects to achieve FOC [full operational capability] in September 2020, three months ahead of the original schedule”. 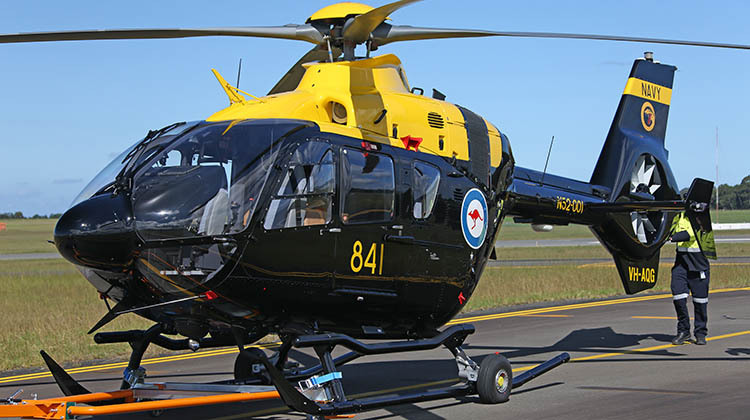 Navy Daily reported on February 23 that the first cadre of Navy and Army instructors for the new Joint Helicopter School have begun training on the EC135, under instruction from civilian contractors from Boeing Defence Australia and Thales. The group will complete their training in July, and will also “validate and verify” the training system. “The training system will deliver a joint Navy and Army aviation training capability that will replace the separate basic rotary training systems that employ the ageing Squirrel and Kiowa helicopters respectively,” Army Captain Adrian Ludman said.